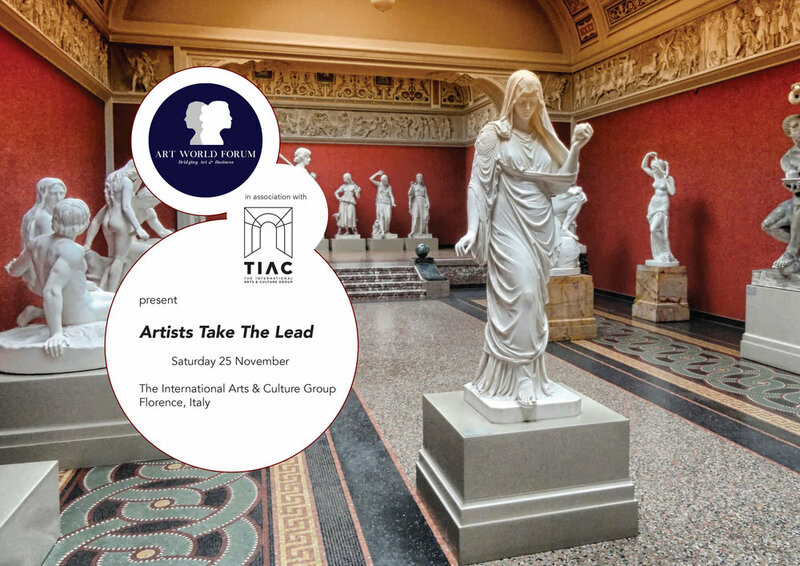 Next Saturday 25th of November, TIAC will have the honor to host 'Artists Take the Lead', an event created by Art World Forum in association with The International Arts & Culture Group to gather all the players of the Art Market together to discuss the artist’s role in society; the liminality between art and commercialization, and leadership in the artistic and cultural ecosystem. Art World Forum is an emerging global platform born in Singapore which aims to build valuable networks between art professionals and business leaders. Through its high quality, high value international conferences, Art World Forum provides unique informational, marketing and networking opportunities to a vast number of art investors, collectors, dealers, insurers, academics, practitioners and overall art enthusiasts. The newly-established initiative is anchored in Singapore and was founded in response to the lack in art & business conferences in Asia. Its goal is to extend various industries and to promote an exchange of various content by welcoming leading art and business experts to promote their expertise. Two young and beautiful women are the leaders behind this start-up, Anni Oates and Veronica Neo, called by The Art Gorgeous Singapore’s Power Duo. According to the Duo, professionals in the art industry are keen on experimenting and testing new ground. The art world has always been a rather opaque environment with a fairly tight circle or individuals. It is refreshing and truly interesting to see people open up and invite the opportunity of having a chat. Anni and Veronica also think Asia is experiencing a renaissance in cultural and intellectual rejuvenation; blockchain may help overcome issues of transparency. Art World Forum's niche is the gap not filled by art fairs and festivals, which offer plenty of opportunities where art may be viewed, displayed, sold or discussed, but without focusing on the marketplace or industry overall; 'the discussions and opportunity to network is the essence of our events' says Annie Oates. The International Arts and Culture Group (TIAC), is proud to present Art World Forum for the first time in Italy to offer a series of conferences about artistic entrepreneurship and about The Artist as an entrepreneur himself. ‘Artists Take the Lead’ will be open to all artists interested in deepening their knowledge of the Art Market, how to deal with it and get involved in it in an organic, effective and fulfilling way. The aim is to discuss current issues and lead positive change in the global artistic and cultural ecosystem, to inspire and encourage change. In a changing environment which demands a proactive attitude, and the ability to wear multiple hats in the industry, the focus is put on practitioners, creativity and problem-solving. TIAC's Team along with Art World forum are looking forward to the results of this collaboration that will offer a wide scale of encounter and also will allow The Artists to take the Lead.